I just got back from the 7. Forum Solarpraxis in Berlin, Germany, held November 16-17, 2006. 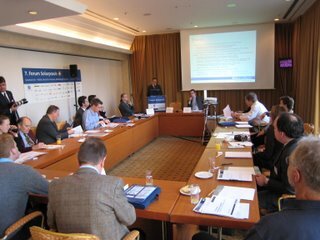 Organized by Solarpraxis AG (FRA:SPA), the Forum Solarpraxis is a solar conference focused on non-technical topics including policy, market development, finance, marketing, and sales. The 7. Forum event agenda can be viewed here. While Solarpraxis is best known for their technical publications, Solarpraxis also offers integrated communications, technical services, and conference forums regarding Solar, Thermal, and Bio energy. At the Forum press conference, Solarpraxis CEO Karl-Heinz Remmers, aka “Dr. Sonne” (The Sun Doctor), discussed Solar Forum improvements for 2006 such as Analyst Conferences for nine significant German solar companies and real time English translation. The official language of the Forum Solarpraxis is German, but the real time translation service was robust, and questions could also be asked in English. Mr. Remmers has ambitions to create the largest Analyst Conference dedicated to Renewable Energy complementing the Forum Solarpraxis agenda. In addition, Mr. Remmers discussed near term plans to extend the Solarpraxis platform to Spain with United States expansion also possible. Carsten Körnig, Managing Director, with the German Solar Industry Association (Bundesverband Solarwirtschaft, BSW), expected the German market to grow by about 10% from 600 MWp to 660 MWp in 2006. I asked Mr. Körnig about international market growth, and he said he wasn’t sure but thought it was double digit anywhere between 10-15% and 30+%. Outside the forum, it wasn’t difficult to engage new business acquaintances on the status of the German solar market. At dinner, I spoke with a module manufacturer and an entrepreneur. The module manufacturer expected a price correction of 10-15% by the first quarter of 2007. However, the entrepreneur believed there might be as much as 400 MWp (perhaps the October 2006 PHOTON International editorial by Michael Schmela was his source?) of solar photovoltaic modules in inventory and predicted a drastic correction across the value chain by March 2007 impacting wafer and cell manufacturers as well. In the Analyst conferences, Sunways AG (FRA:SWW), a vertically integrated manufacturer from cell and modules to inverters and systems, provided insights into the tribulations facing a medium sized, forward integrated system solution company during the German market slowdown. Solar cell material costs have surged from 65% to 87% driven by higher wafer and polysilicon prices reducing solar module margins. Higher module prices have contributed to solar module inventory build in Sunways’ warehouses, but Sunways CEO Roland Burkhardt predicted module inventories would be reduced in the fourth quarter 2006 as the solar market transitioned from a seller’s market to a buyer’s market. Since German market growth has slowed and growth markets in Spain, Italy, California, and Asia have not compensated, the solar module inventory build must impact solar wafer and cell manufacturers at some point. Right now, solar module manufacturers, distributors, and system integrators are left holding the inventory. Is this the result of take or pay contracts propagating from silicon suppliers through to the solar module channel? One thing I didn’t expect from the 7. Forum Solarpraxis was to eat so well. Besides a continental breakfast, coffee breaks, and lunch, there was also a dinner the first evening. My top suggestion to the Solarpraxis team is to make the event a no smoking affair; this will help prevent annoying carcinogenic greenhouse gas emissions and promote healthy lungs! Dear Edgar, being active in the solar business I must state what they were telling you in Germany seems unlikely. The German marked will definitely not show any growth in my opinion; it will show a steep decline of 15-25% this year. The volumes installed in 2005 will impossibly be matched in 2006. This is due to the feed-in tariff in Germany having been reduced with again 5% by Jan. 1st this year and solar module prices increasing rapidly during 2003-2006 due to the exorbitant silicon price increases. What we are currently facing is a steep decline of solar module prices too, because many manufacturers are stuck with stock. Why? It is simply impossible to maintain a German market with reducing feed-in tariffs (next Jan. another 5% down) and high module prices. The end-user — whether a solar fund or private person — cannot make a sensible ROI with this feed-in tariff and modules at this level. Luckily we are already seeing spot market silicon prices decline since the peak in July. Module prices are coming down hard since the Dresden exhibition, where the most significant event was the consultants still shouting the market was growing in double digit numbers, but the people and business’ screaming for modules were not there anymore. A true picture of the market is further easily derived from the fact that Germany absorbed 50% of the world capacity and Japan 30%. Both markets are now reducing fast, thus it is not possible that the market will still grow 20-30%, unless new markets all together 10-fold their module consumption. Nevertheless, after corrections in silicon prices have materialized in a sufficient way and a shake out amongst certain players in certain segments has taken place, the solar market will again grow with double digit numbers; but that is not now and possibly not even next year. For any business that knows how to deal with this it will not be a problem and for consumers it is good news. I think it is a healthy correction that was much needed, however devastating it may prove to be for ever so many new companies on the market that didn’t know what they got into.